It’s the most wonderful time of the year people. Time to put on our winter coats and get to eating. When I was little we used to have a huge get together with my mom’s side of the family – 13 aunts and uncles and their kids. It was such a happy time of playing and eating. While we no longer get together with all my extended family, I still like to have gatherings for the holiday and eat all the food. Enter Friendsgiving. I’ll be hosting a little Friendsgiving get-together this weekend just before I head home to have the big meal with my family. We’ll sit and eat, chat, watch some football and play games. There may even be a holiday movie thrown in there. For this little soirée, I’ll be making the turkey and the green bean casserole. But since I don’t want to be turkey’d out before Thanksgiving, I’m serving amped up versions of these traditional dishes. 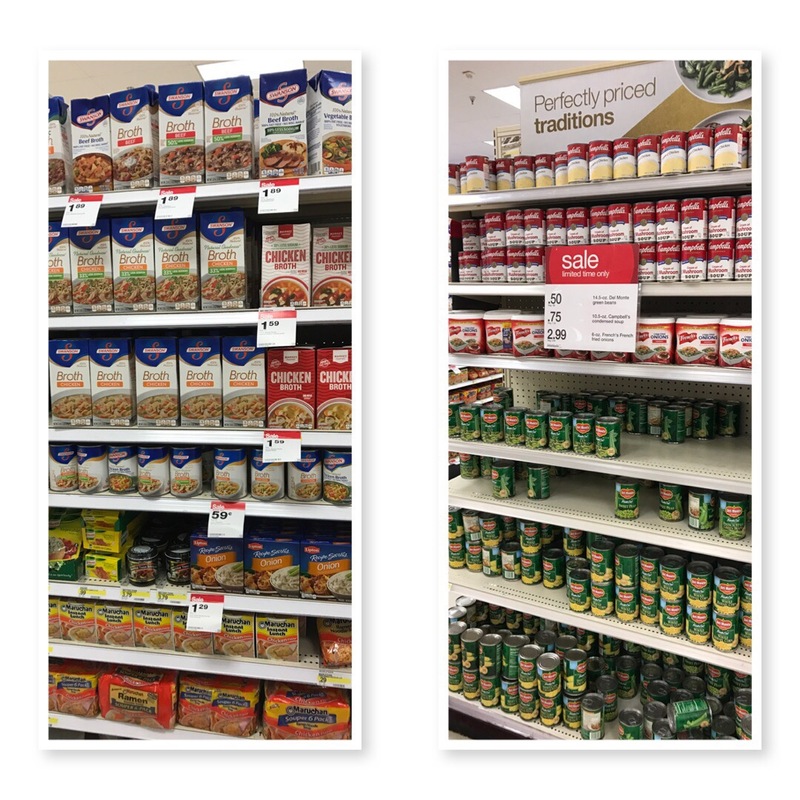 Around our home, you just can’t have a holiday meal without Green Bean Casserole. Seriously, one year my mom tried to leave it out so I started making it every year just to ensure it was on the table. Since no one signed up to bring sweet potatoes (or yams) for dinner, I decided to incorporate sweet potatoes into my green bean casserole. Oh yes I did. And then I stuck it all in mason jars so there’s a little cute factor on everyone’s plate. On my weekly jaunt to Target (gotta love that Dollar Spot) I found all the ingredients for this dish right around each other. So convenient! On my next trip, they had even moved it into the Dollar Spot area. It’s like they knew I was coming. I love using cream of mushroom soup in my holiday meals because it is a quick and easy option to a great dish. The Del Monte Fresh Cut Green Beans are my favorite for this family favorite dish. With green beans, water and salt as the only ingredients in the can, you can’t go wrong. Do you use chicken broth for your boiling needs? I always have a can of chicken broth on hand because I use it whenever I am boiling any type of potato or green beans. It adds flavor to the dish and has no MSG. And here’s an extra treat for you – Cartwheel offers. Will you be hosting a Friendsgiving this year? I’d love to hear what you do at yours if so. Add chicken broth to a medium saucepan and bring to a boil. Add sweet potatoes to boiling chicken stock and water. If needed, add some water to the chicken stock to cover sweet potatoes. Cook for 20 minutes until fork tender. Drain sweet potatoes and add butter, brown sugar and cinnamon. Mash together and add a dash of milk to make creamy. 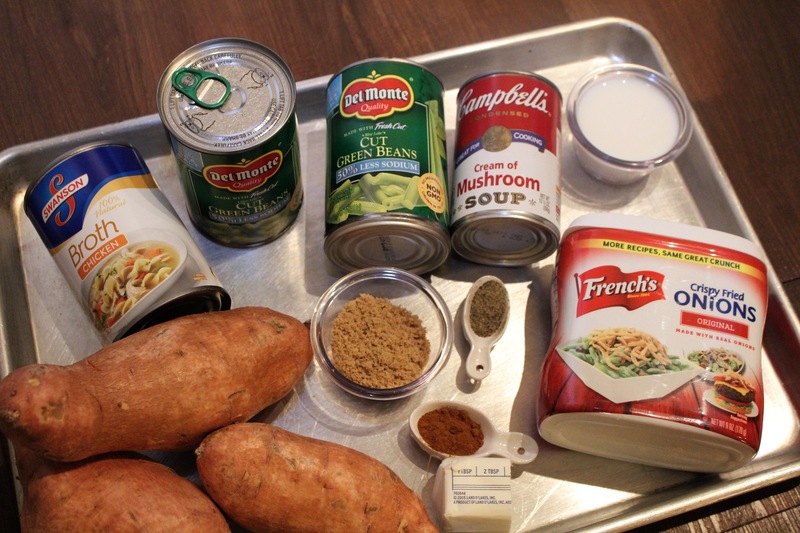 Prepare Green Bean Casserole by mixing together drained green beans, cream of mushroom soup, milk and black pepper. Mix together. Add half the crispy fried onion to green bean mixture and mix together. Fill 12 – 4 oz mason jars half way with mashed sweet potatoes. Reserve remaining sweet potatoes for topping. 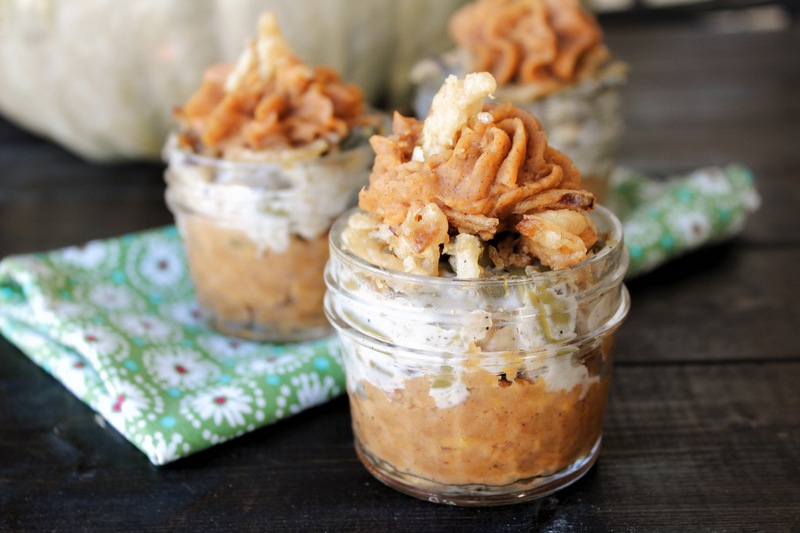 Evenly divide green bean casserole to the mason jars. 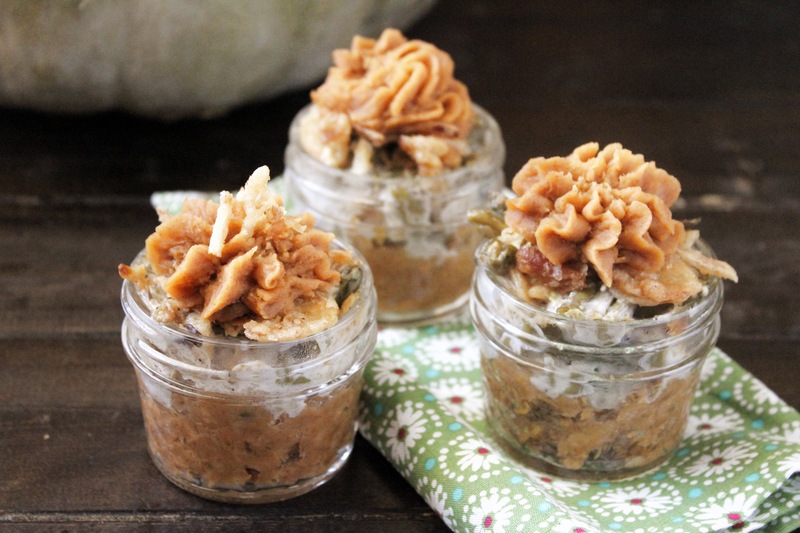 Place mason jars on cookie sheet and bake for 17 minutes. 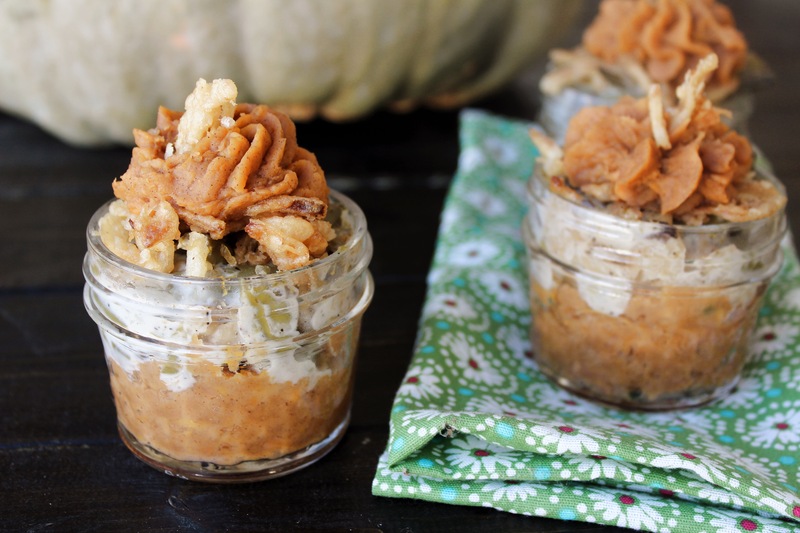 Top mason jars with remaining fried onions and bake for an additional 5 minutes. Place reserved sweet potatoes in pastry bag fitted with a star tip. 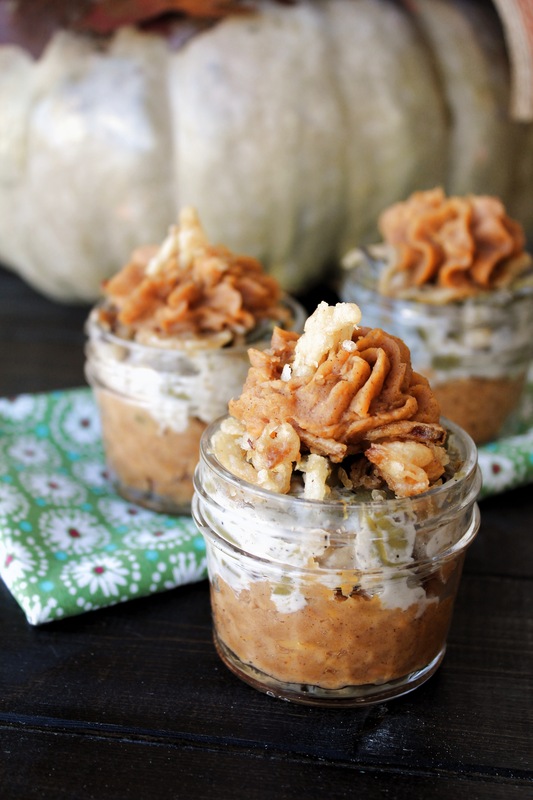 Place a dollop on top of each mason jar.